“A café is a very different thing in Australia,” says Nick Mathers, the Sydney-born restaurateur behind NYC’s Ruby’s and the casual all-day Little Ruby, which he recently opened in Santa Monica. “When I first got to the States, I thought, ‘Why don’t these cafés have good food?’” Mathers serves the sort of breezy brekkie fare for which Australians—and Angelenos—have long held affection: avocado toast, grain bowls, and flat whites (lattés with less milk, basically). Little Ruby isn’t alone. Australian-inspired cafés have surged across the city in the past few years, with Westsiders saying “g’day” to squash pancakes at Bondi Harvest and downtown dwellers nibbling on Bronzed Aussie’s ground-beef pies. But it turns out we’ve seen only the tip of the iceberg in terms of what’s being offered from Down Under. 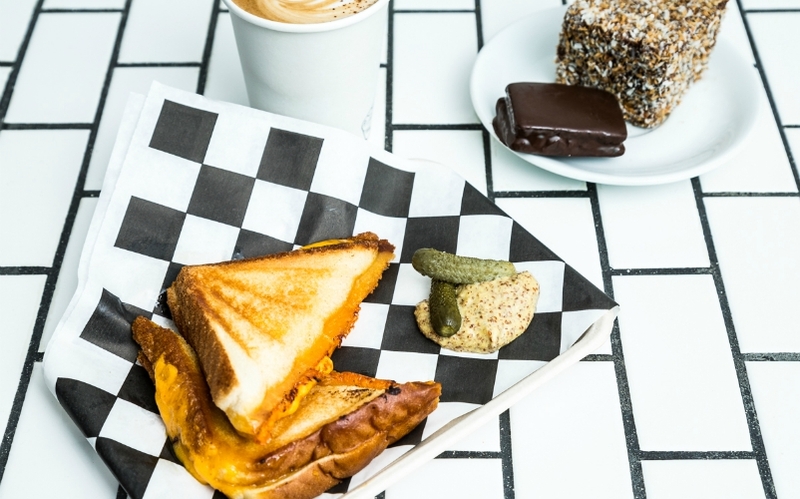 Consider Little Ripper Coffee: At the postage-stamp-size shop in Glassell Park, the signature snack is the jaffle, essentially a grilled cheese sandwich with a pressed crust. The prototypical Aussie nibble is something “a ten-year-old might have after school with tea,” says Melbourne native Rex Roberts, who co-owns the café with his wife, Lorena Jurado. Roberts stuffs the sandwich with fillings that range from no-fuss (cheddar, with mustard and some cornichons on the side) to fancy (Brie, green apple, and mango chutney), using a metal press to smush the crusts together and send cheese oozing out the edges. The café even offers an option to add the ever-divisive Aussie staple Vegemite to your jaffle, and it’s not the only place daring to serve the umami-rich spread. You’ll also find it at Echo Park’s Pollen, a venture from Brisbane-based Happy Fat Group. On the café’s wraparound patio, you can order a house-made English muffin slathered with Vegemite butter and served with local eggs, Jarlsberg cheese, and arugula. At Little Ruby, the stuff is paired with toasted Gjusta sourdough during breakfast, but you might consider catching the ocean sunset views at dinnertime instead. There’s pappardelle with lamb ragu, pineapple-and-beet-topped burgers, and spritzes spiked with Regal Rogue vermouth (flavored with native Australian aromatics). It’s almost enough to make you forget which continent you’re on.